Why is Wood Flooring So Much Better than Carpeting? What makes wood flooring better than carpeting? Read why below. When it comes time to install new flooring in your home or plan out the floors going into your new home, you’ll generally have a choice between two varieties – hardwood flooring and carpeting. Which one is better and why? You might think that we here at Jason Brown Wood Floors would be partial in this debate, and we are! But there are actually real, significant benefits to wood flooring over carpeting that you should know about before making the decision. Well-made, high-quality carpeting has a lifespan of around eight to fifteen years assuming you care for it properly. This may sound like a long time, but consider that wood flooring, when made from solid wood, can have a one hundred year lifespan! Even wood floors made with engineered wood can last up to seventy-five years without being replaced. 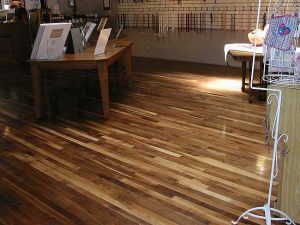 This is primarily due to the fact that hardwood can be refinished when the top layer wears down, while carpeting needs to be replaced entirely when it wears out. Between messy vacuum cleaners, spot cleaners with exacting directions, and expensive steam cleaners for those impossible to remove stains, why deal with the hassle of keeping carpeting clean? Wood flooring simply requires a wet mop and a cleaning kit to keep it free of dust, dirt, hair, and other mess. You can even make your own cleaning solution out of vinegar to drive your maintenance costs down further! Carpeting is a haven for allergens like pet dander and dust mites that can make your home a rough place to be for those with allergies. Since wood flooring is so easy to clean, once you use your wet mop and cleaning solution on it, you can forget about having allergens in your home! Carpeting is usually made out of synthetic materials which can end up accumulating in a landfill. Hardwood flooring is made out of natural materials, however, making it much better for the environment! This entry was posted on Thursday, April 6th, 2017 at 1:41 pm. Both comments and pings are currently closed.